Support for the original XBOX and XBOX 360 will be coming back soon. This is because the folks over at RetroArch have reverse engineered the Makefile targets for Visual Studio which makes maintaining these platforms a breeze. 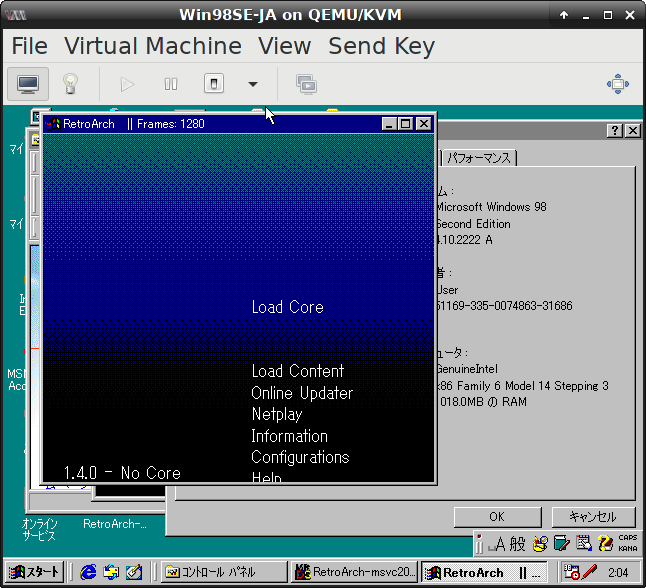 RetroArch on Windows 98. RetroArch on your fridge/toaster may come up next! The team over at RetroArch have also acquired some devices such as the NES/SNES Classic, Steam Link and GCW Zero. This means that we’ll eventually see a port on these consoles. On the S/NES Classic (probably a port that a good amount of you want), the approach to implementing the cores will be different as RetroArch may be an extension of the S/NES Classic’s regular UI rather than a whole UI altogether. This will make RetroArch look much better since it’ll integrate directly into the UI itself. A good deal of work needs to be done before we see a S/NES Classic port so don’t pester the hardworking people at RetroArch for a release. Windows 95 support (yes, 95 for people that love utilising their old computer to he maximum) will also be officialy implemented soon thanks to Brad Parker (as he seems to like extending backwards compatibility to older versions of Windows). A Direct3D 8 fallback will be implemented so RetroArch will run on every card newer than the Geforce 3(included – excluding the Geforce 4 MX) and ATI cards released in the same era. OpenGL 1.x support will eventually come to RetroArch so lots of older cards will be supported but don’t hold your breath as they don’t know when it’ll start working.